Tim Tebow to seek trade or release by New York Jets? Published: Dec. 18, 2012 at 08:20 p.m. Updated: Dec. 19, 2012 at 03:25 p.m.
Tim Tebow surely knew this before Tuesday, but now there can be no doubt. He has no future with the New York Jets. » Darlington: Is Tebow's time as QB nearing end? 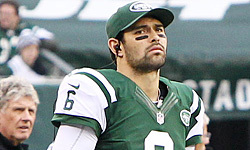 » Will Sanchez be the Jets' QB in the future? » More to blame: Sanchez or Ryan? This isn't a home for Tebow. It never really was. Tebow's next step is trying to connect with a team that will give him the opportunity the Jets never did. The New York Daily News reported Tuesday that Tebow will request to be traded or released after the season assuming Greg McElroy starts the Jets' final two games. Tebow is scheduled to earn $2.6 million in base salary in 2013, but the Jets can cut him with a minimal cap hit of $1 million, the paper reports. Earlier Tuesday, NFL.com's Jeff Darlington cited a source close to Tebow in reporting that the Jets' decision to bypass him is "still too fresh," and will necessitate digestion and contemplation before he makes his next move. In truth, there isn't much to digest. As long as Rex Ryan is in charge of the Jets, Tebow won't be a starting quarterback in New York. If Tebow still intends on having a career as an NFL quarterback -- and you have to suspect he does -- the Jets aren't an option. Someone will take a chance on Tebow in 2013, just as the Jets did in 2012. The Tebow carousel is about to spin once again.